This game is all about the golf and if you’re looking for a challenge then this is the game for you. This game makes you think, no more hit and watch as the ball lands 6 inches from the hole like other golf games where it’s all laid out on a plate for you, The Golf Club 2 will have you thinking and sometimes even crying over those 4 feet putts that should have easily dropped but somehow end up off the green. This is a thinker from start to finish. You will you have to plan your next shot hoping that you don’t end up leaving yourself a nasty approach to the flag over a bunker the lie of the ball, swing tempo, wind direction and green elevation all come into consideration. Once on the green it all comes down the feel of the swing, get it right and it will put a big smile on your face, miss and you will be climbing the walls in frustration. But don’t worry you won’t be out there alone with the ability to create your own society and join several groups from around the world you will soon feel the satisfaction of finishing level par as Barry from Wales finish 27 over par and you know it’s not just you getting a beating from this game. 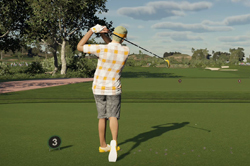 The ability to create a society really does add something different to this game with your society growing over time, and the real-world competition really adds an extra dimension to every missed putt or sunk birdie. 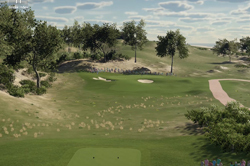 The golf club 2 provides endless game play with the golf course editor section and over 100,000 user created courses available you will always find a new challenge it’s a shame there are still a few issues to be ironed out as it takes a little away from what could be a great game.